I'm not familiar with the verb 'to frickle', but presumably it's got something to do with the act of remixing, because this release collects one disc of remixes BY Apparat, and one disc of remixes OF Apparat. I hope that's clear. Scanning over the tracklist here, it's evident that Sascha Ring's worked with plenty of illustrious producers and artists over the years: Monolake, Modeselektor, Thomas Fehlmann, Telefon Tel Aviv and Paul St. Hilaire are all embroiled in this, and that's just a relatively curtailed overview. Starting off the first disc, Apparat tackles Francesco Tristano's version of 'Strings Of Life', leaving some of the piano intact whilst building up some tricky micro-funk beats around it. Something you'll notice across the spread of these remixes is that throughout, Sascha Ring isn't merely interested in swapping the beats around, but instead entirely redesigning them, often adding those distinctive clouds of granular synthesis to the mix, which sounds positively orchestral on tracks like Lusine's 'Drift' and Nitrada's 'Fading Away'. One of the more recent cuts on disc one features Apparat remixing himself on 'Fractales', listed here as the 'Ibiza Version', which originally appeared as a B-side on the Holdon EP from last year. I'm not entirely sure where the Ibiza element comes into it, but it's certainly an impressive pop-fuelled piece of programming. Rounding off the first disc, Moderat, the 'band' formed by Ring and his Bpitch pals Modeselektor makes a welcome reappearance via a reworked version of 'Let Your Love Grow', featuring Paul St. Hilaire. 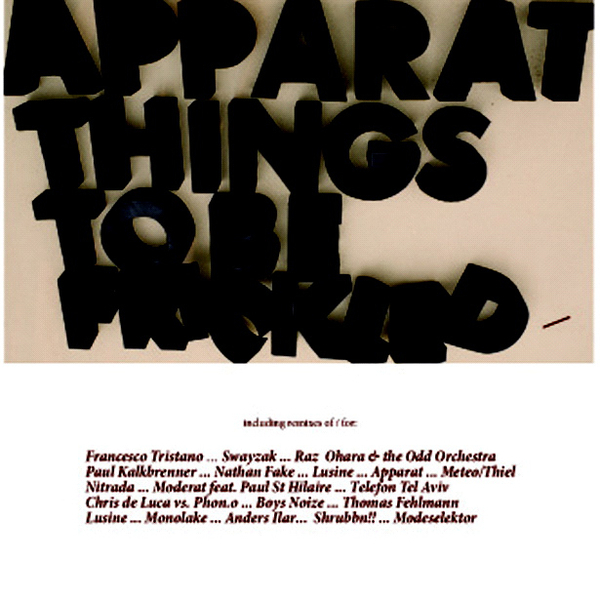 When Apparat becomes the subject of a remix the results are no less impressive, as proven by disc two, which carries some particularly inspired work from Anders Ilar and Monolake as well artists like Boysnoize, Lusine and Raz Ohara who give Apparat some 'shoe on the other foot' treatment with no small measure of style.